I visited Edinburgh over the Bank Holiday weekend and made a trip to the National Museum. After watching the excellent 2015 film version of Macbeth, I was keen to have a look at the artifacts from the 10th century. Looming over the beautiful Nordic chess pieces, combs and brooches was a Pictish stone carved with symbols. 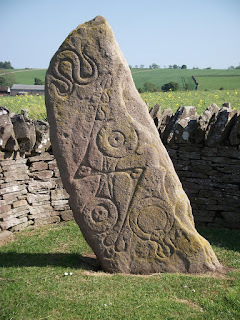 In true 21st-century-dumbed-down-museum fashion, the accompanying blurb simply reported the Pictish origin, and flatly stated that the carvings were a mystery. Thankfully it didn't take much of a google to find that more information is readily available. 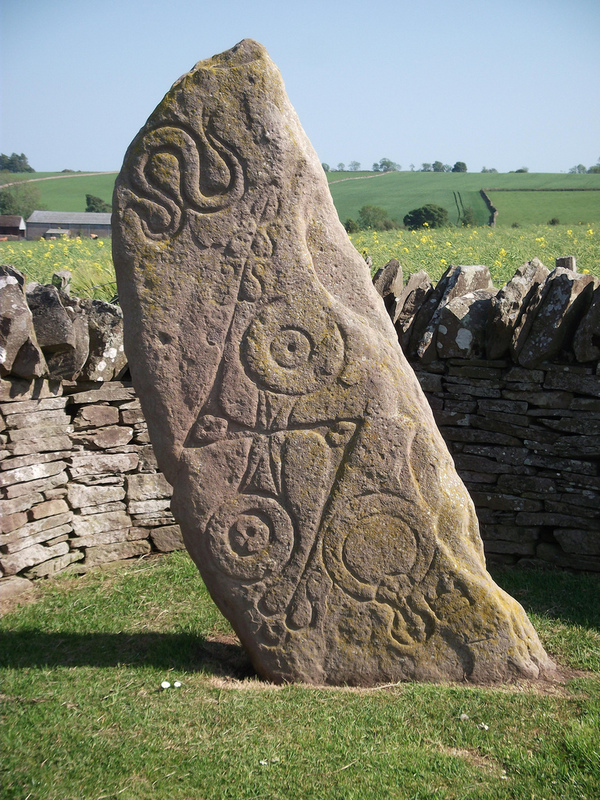 Though the exact meaning of Pictish iconography is indeed contested, there is a distinct vocabulary. One of the common arrangements which Wikipedia neatly outlines here. Two of these common schemes feature 'rods' set against crescents or double disks. The rods are perplexing, and this rather thorough article posits that they could be, among other things, spears, 'wandering' planets, or perhaps the constellation Leo. 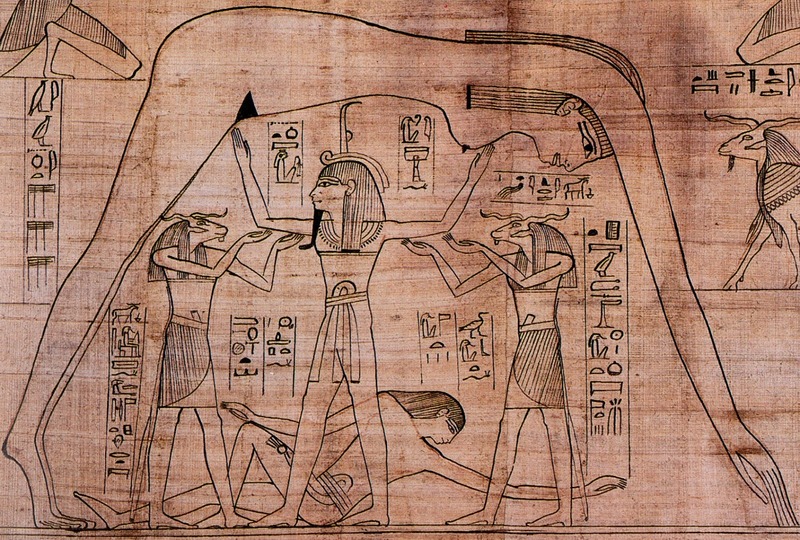 The two discs could be the sun and moon, though they do look similar in carved form and the moon is usually depicted as a sickle to distinguish it from the sun, which suggests this is incorrect. 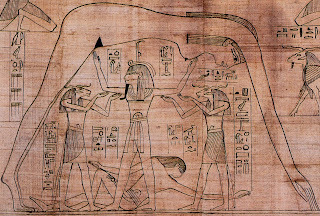 The crescent could well be the sky and its curved shape reminds me of the silhouette of the Egyptian goddess Nut, who is often shown bending over the world and the curve of her body forms the same silhouette. 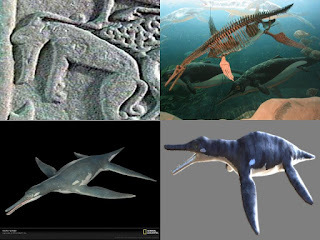 Just to get a bit of cryptozoology into this discussion, the Pictish stones sometimes feature animals, one of whom seems to be a kind of sea monster. The fact he had a long snout and four distinct limbs had prompted some to suggest he's a plesiosaur or pliosaur. I love the idea of Macbeth having to fight prehistoric sea monsters (before he starts murdering kings, of course) and I am sure there is an early draft of the play somewhere in which he does this. Being a massive JG Ballard fan and having enjoyed his A Field in England, it was with some anticipation that I went to see Ben Wheatley's High Rise. Despite its mixed reviews, I enjoyed the amazing production design, cinematography and effects. The cautionary tale of humanity devolving inside the microcosm that is a tower block lead me to think more about how these (mostly failed) post-war architectural experiments are linked to folklore and psychogeography. The architect has his own penthouse at the top of the imposing tower block, and in keeping with the eccentricity his profession is famous for, has included a pool and an exotic garden. This is the set-up behind the film High Rise... and the real life story behind Beetham Tower in Manchester. 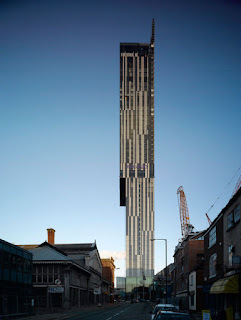 Beetham was competed in 2006 with architect Ian Simpson at the helm, who occupies said penthouse complete with pool and indoor forest. 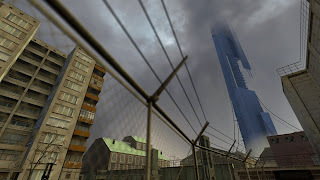 On a recent visit to the city, a friend pointed out that the similarity between Beetham Tower and The Citadel in Half Life 2 is a cause of much hilarity. The images below attest to this. A shortlist of towers that personify oppression can continue with; The Ministry of Truth in the film version of 1984 (actually filmed at Senate House in London, which Hitler allegedly wanted to use as his headquarters once he'd invaded), Freder's high-rise tower in Metropolis, and, most imposing of all, Sauron's Barad-dûr. The looming, omniscient nature of these structures makes them ideal abodes for evil do-ers, who, like the overseer's in Jeremy Bentham's Panopticon, can potentially observe anyone at any time. They therefore have the ability to instill a kind of fear like no other in us. It was a combination of technological advances (concrete and steel, and elevators) and the necessity to build mass-housing fast that lead to the proliferation of the high-rise after the war. A few cities, most notably New York, had seen high-rise habitation previous to this, but not on the scale demanded by the destruction wreaked by WWII. Their history is, therefore, short and consequently their psychogeography and popular folklore is often limited to living memory. Clive Barker's The Forbidden (later filmed as Candyman) is one of the few dramatisations of folklore-in-tower-blocks and even it has to rely on American Civil War heritage for its origins-story. But it does a great job of articulating our fears that buildings are not quite as solid and safe as we would like to imagine (in Candyman it's hidden voids in the structure which facilitate the horror). The Hellraiser trilogy, Ghostbusters and Dario Argento's Infero flirt with the notion that a skyscraper's architect has imbued his creation with the potential to summon things from beyond. Back in the real world, most ghost stories associated with high rise buildings tend towards the Candyman precedent of the specter's origins being associated with the geographical site, rather than any event which took place in the modern building. Here is one example from New York featuring a block of flats built on the site of an old hospital and here another about the Sunshine 60 building in Japan which is built on an old prison (although the article does go on to say there is some evidence to suggest that it's dead residents or visitors who are the specters, not the old prison inmates). Social instability, physical decay in the form of cracks, rusting of the reinforcing steel and spalling have lead to many tower blocks being demolished. This adds an interesting dimension to their psychogeography, for in their case the cycle of construction, event and demolition so often central to folk memory has been sped-up. In my new home of Nottingham the famous Brutalist Hyson Green development only lasted 23 years, from 1965-88. 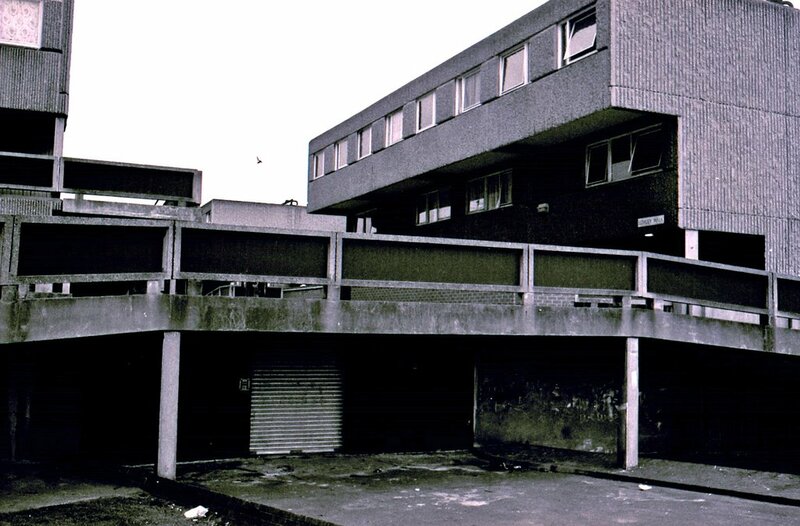 There are a cheerful 52 results on the Media Archive for Central England's list of events linked to these flats, many of them rather grim. Ex-residents still talk about the events in the flats, and these stories will no doubt become embedded in the folk memory of the city. Perhaps Nottingham will have its own Candyman to walk alongside Robin Hood one day? An interesting footnote to this topic comes from countries outside of the West. In the occident, pressures on land are so great that abandoned buildings are not allowed to stand for very long before the real estate is redeveloped. This is not the case the world-over and there are many examples of haunting, giant husks of abandoned skyscrapers from regions like China, North Korea and Bangkok. To the Western eye, these empty buildings have an mistakable post-apocalyptic vibe. The number of articles billing them as 'creepy' attests to the way they affect our sensibilities perhaps more than their immediate neighbors'. The Citadel from Half Life 2. The foot of the New York high-rise in Argento's Inferno, one of three residences designed to house the three witches in his Three Mothers trilogy. In Candyman the fabric of the Cabrini-Green housing projects of Chicago proves not to be as solid as it first appears. Clambering into the structure through an abandoned flat doesn't end well for this reporter. 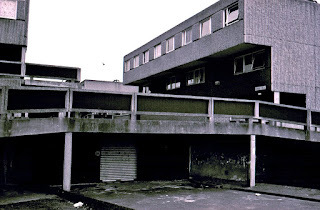 Closer to (my) home, the Hyson Green flats were by largely deemed a failure and torn down after 23 years of use.